Well, it's been a shite day. I've been on the wire before but today took the cake. Not only did I have to deal with morons from the local civil disservice servants masquerading as art doyens, I was also faced with a director who seems determined to ruin us with his forgetfulness. Which almost cost me US$3k to almost have a blank page in a publication. To say I was pissed off is an understatement. Then I realised he'd forgotten to mention that he had received a critical piece of information that caused me to not only lose a day of productivity but alsoi have to work late (gee, que surprise) in order to complete it. But worse .. much worse ... it also caused me to kick the arse of a civil disservice chickie who, while she usually deserved it, truly did not deserve it today. I was so mad at the director for putting me in the position of having to apologise to her for his over-sight. And he had the gall to try to suggest that I could pretend that it was her fault anyway. I might be an uptight cow who will kick your arse to kingdom come if you cost me money, but I really hate it when peeps are accused of something wrongly. Even if I am the accuser. So I sent her a note to apologise and accepted that it was our (not me but hey, I am a bigger man than him!) fault. It was the only decent thing to do. I was so pissed off with him that come 9pm, I pretty much said Feck it and buggered off home without bringing any work home. A radical thing, I can tell you. Stop worrying, ye of little faith. I did manage to finish the project with the misappropriated info before I buggered off. I also had not eaten today. For some reason, the maid's cooking has been really off recently and no one can really eat her lunch anymore. I went to a food court and bought mee poh home. And then guilt struck me. It's not terribly healthy, is it? And my throat has been feeling a little raspy and I think I am too "heaty". 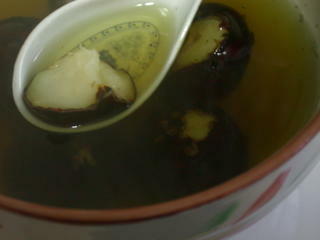 So I decided to make waterchestnut soup. It's a traditional Chinese sweet broth made with waterchestnuts that is supposed to cool down your body and is supposed to be generally good for you. I bought a basket of them and went home to sit in front of the telly with my trusty fruit knife and brush. It's tedious business preparing waterchestnuts the way my mum did. You have to peel off all the fine, papery "leaves" from the waterchestnuts. Then you scrub it to get rid of all the mud. Then you peel the top off the chestnut so all the hard, fibrious stalks is lopped off. But you keep the skin. Why? I asked that as a kid too .... terribly distressed at having to crunch and chew through all that "bark". Because most of the nutrients and fibre is in the skin. The flesh of the waterchestnut is not as packed with goodness. Even if it tastes good. It's dead easy to make the soup. 1. Prepare the waterchestnuts as described. If you are really lazy, just take the fruit knife and peel off the whole skin .. try to leave some flesh. Easy huh? Drink the soup. Drink the soup. Drink the soup. Listen to me nag. All the goodness is in the soup. You can discard the waterchestnuts now actually and all you need is the soup. But I eat the waterchestnuts too. It makes me feel virtuous. Another rare occurence. Am extremely busy so to peeps who have been wondering where I am, am in the midst of hell but this weekend I am supposed to go to an ex-colleagues house at her command. For some strange reason she wants my famous mulled wine so I am gonna make her some. Wrong season, wrong climate but hey, it's booze! We will also be making a cheesecake and she might want me to make my Margarita Wilson too. Well, watch this space to see what we would come up with. We're both good cooks and used to pig out together all the time when we worked at the same hellhole. But this will be the first time we are cooking together. Could be fun. Could also be murder. Hi Stephanie - wow - you remember the Margarita Wilson - I'm honored! - you probably remember it better than I do now, since, having moved to the USA I tend to use the MUCH cheaper Triple Sec instead of Cointreau and use a mix of lime juice and Margarita mix (so lazy one!) instead of fresh squeezed lime juice. Sign of the times. I was interested to see that you are goingt o make a Mulled Wine - I love that type of thing and there is a great one which is just our of this world - it is a traditional German one called Feuerzangebölle (pron. foyr-tsangeboelle). Literally, it means Fire Tongue Bowl. Take 2 bottles of red wine and heat them in a LARGE fondue pot (a flame one is better than an electric one). Add the juice of two oranges and one lemon. You can add a piece or two of cinnamon bark or cloves, but not necessary, so only add these if you like this taste. Bring this to just under a boil. It is important that it is v. hot but MUST NOT burn - will completely ruin the wine. Now, in Germany, the next instruction is easy because there is a specific kitchen utensil for this purpose called a Zange - it is like a trowel with a space right through the centre from handle to tip. If you don't have one, you can use a OLD metal sieve (NOT PLASTIC!!). The sieve should not drop down into the wine mix though, so be careful about this. In the sieve, place a good one pound worth of sugar cubes in a tightly formed heap (again, in Germany they manufacture conveniently shaped sugar cones for this purpose). Now comes the special part. You need one bottle of dark rum. Pour the rum into a glass measuring jug. Using the spoon, soak the sugar lumps so that they have a good covering of rum on them - but not so much that the rum is running into the wine mix. Using a metal table spoon take one table spoon of the dark rum and hold a flame under it to heat it and then light the rum and pour it over the sugar. Make sure your spoon is not still on fire before placing into the measuring cup of rum for the next batch. The aim is to set the whole batch of sugar on flame and have it and the rum melt into the wine below. If you do it correctly the last drop of rum should melt the last batch of sugar. Serve up into wine glasses (with a metal teaspoon in to stop the glass from cracking) with a ladle and it is ABSOLUTELY delicious. With all the sugar in this it is pretty sticky so recommend that you serve a paper hanky/towel with each serving. Caution: although the flaming of the rum is meant to burn off the alcohol, I have never thought of this drink as being anything other than an elegant pre-meal leg-opener, so don't plan on driving after drinking this concoction. Daaaaahhhhling, of course I remember Margarita Wilson! It as the cause for Kristina keeling over after just 3 sips at her party. How could I ever forget? Using a margarita mix instead of real lime juice? That is so wrong. If & when I go over to visit you, I will bring a bottle of the real stuff if US Customs does not try to steal that away from me. Is the Chinese takeout chap still there? Mebbe I can sweet-talk him into giving us some real lime juice. LOL. And OMG! That is my fave drink in the world. Feuerzangebolle - major orgasmatron fuel! I used to have that during Christmas in Germany. There was always a kiosk at the Weihnachtsmarkt near my house. After getting off the tube, I would go to the kiosk and get a cup and hand my thermosk to them to fill 'er up! In Germany, they use a giant block of sugar which is heated with giant bunsen burner looking things. They would keep pouring ladles of rum over it and the smell would send shivers up me timbers. There was one kiosk that made it with brandy and it was to die for but that kiosk disappeared within a week. My mulled wine is actually a cross between a gluhwein and feuerzangebolle. I use rock sugar on the sieve like the ones the Chinese hawkers use to ladle up stuff and pour enough brandy over the sugar that I can flambe it and continue to pour & flame with addition ladles of brandy. I also make my orange "land mines" which are actually my clove studded oranges that I send floating into the murkey depths of my feuerkhanbolle. There are loads of spices and other stuff that I add but I am a little reluctant to reveal my secret recipe ... hmmm. This is really making me miss Weihnachten in Europe. It's just not the same here.